This website explores the origins of my maternal (Becker) and paternal (Zwar) families, who ventured to Australia from Europe in the mid 19th century, and tells the stories of their descendants in Australia and Germany. Immanuel Seminary, Adelaide. Ordained as Lutheran Minister 1964. Married: Del Heinrich, (from Worlds End, Burra, South Australia) in 1965. We have four children, five grandchildren and one Jack Russell. Interests: Family, Woodwork, Sport, The Wends, Art and History. This website was launched in July 2012. Unlike a published book, the content of this site can be edited and added to at any time. You will see that some pages are not complete – but the site will continue to grow over time. It is always a work in progress. The future success of this website depends on you just as much as me. If you are looking for information on your family and can’t find it here, maybe you haven’t supplied me with the material. Please send your information and I will publish suitable material under your name. Thank you in anticipation! Your generous support is much appreciated. I was born in the Laura Hospital in South Australia in 1940, the same week that Dave and Mabel were married in the ‘Dad and Dave’ radio serial. In the real world Hitler was entering the Balkans and ‘The Advertiser’ announced that Winston Churchill was to make a special broadcast the next morning. One of my earliest memories is when I was about three years old. I went into a room at the old Church manse at Pine Creek with about seven other littlies for one of my first Sunday School lessons. I was particularly excited this day because a favourite cow had calved on our farm early that morning and I eagerly announced to the teacher that our cow “had a ‘motchi’ this morning”. The other children all laughed heartily at me. I was aware that they didn’t laugh with me, but at me, and I was disconcerted! It would be another 40 or so years before I realised I had used a Wendish word and none of the other children had Wendish ancestry. In the whole Parish only the original Pech and Zwar ancestors were Wends, and not Germans. In 1946, just months after the War had ended, I started school at the little Stone Hut State School. An older sister and brother each gave me some clear instructions on our 8 kilometre journey to school in the horse and jinker on the first day: They warned me not to use any German words like ‘Mutter’ and ‘gesundheit’ but to say ‘mother’ and ‘bless you’ if anyone sneezed. My mother’s Becker ancestors were originally German. Every Friday our mother drove about 10 kilometers to Laura to do her shopping. She always called on her mother on the way home and they often conversed in German. As little children we picked up some German words. In fact we affectionately called our grandmother “Mutter”. When I was about 10 years old Uncle Harry Zanker, my godfather, gave me the book “Biggles Flies North” as a Christmas present. I loved it, and in the following years I read every Biggles book I could get my hands on. I think I read over 40! The Library at Immanuel College, the boarding school I attended in Adelaide, had many Biggles books and I read all of them and took great delight in Biggles outwitting the German air ace in all of their tense battles. I have always thought of myself as an Australian. I was the third generation born in Australia on both sides. I never thought of myself as German or Wendish, but always as an Australian, and proud to be a subject of the British kingdom. It was mind blowing for me to learn that my ancestors on my father’s side were Slavic, and not German. This discovery kindled my interest in the Wends and this interest has grown over the years. Added to this has been my love of history since childhood. History was always my favourite subject in school. The history of my ancestors, including the Wends, has become a lifetime study for me. Some of my family and friends might say an obsession! After my ordination as a Lutheran pastor in January 1964, I moved to Gympie, Queensland, as the first resident pastor of the United Evangelical Lutheran Church. The move to Queensland was significant for me and I have never returned to live in South Australia since my ordination nearly 50 years ago. My ministry as a Lutheran Pastor has led me to live in Queensland, New South Wales and Victoria, but not South Australia. I am now retired and live in Melbourne. Three of our children live in Sydney and one in Melbourne. Living interstate has its advantages and disadvantages for collating family history. A big disadvantage was that the vast majority of my Becker and Zwar ancestors lived in South Australia. I found it was almost impossible to get a relative to write down their life story or the stories of their ancestors. I usually had to visit each personally, take notes, and then write up the history myself. Not living in South Australia has been my biggest drawback for Becker and Zwar family history research as the time I could spend in South Australia was limited. Another disadvantage is that South Australians tend to be very localised. They tend to assume that if one was born in their State, one will always know all their relatives, friends and family connections down to the present day – even though one hasn’t lived there for many years. I sometimes remind them that I can’t be expected to know about anyone born in South Australia in the last 50 years! An advantage in moving interstate is that I have met relatives who also lived interstate and some have supplied me with valuable information. I have found that those people with valuable letters and photos are not necessarily those who live in the home district of their ancestors, but the ones living far away. For example, when there was a marriage, letters and photos would be sent to the relatives living far afield, and these were often kept and treasured and made available to me. Living interstate enabled me to meet up with many descendants of Michael Zwar, the first Zwar to emigrate to Australia. Michael settled in Victoria and had 11 children. My South Australian relatives had lost all contact with this branch of our family and in later years I was able to complete the history of Michael, his wife and their 11 children. A further advantage is that I have made contact with many Wends who also live interstate, particularly in Victoria, where I became the first president in 1986 [and for ten years] of the first Wendish Heritage Society in Australia. In 1966 the two Lutheran Churches in Australia united to form the Lutheran Church of Australia. There was a lot of parish reorganisation. In 1969 I became the first Lutheran pastor in Gladstone, Queensland. By a remarkable coincidence I met an elderly couple who asked me if I knew Arthur Zwar, who had been their neighbour for many years, but had now retired to Adelaide, South Australia. I assured them he would be a relative but I had never heard of him. They gave me Arthur’s address and I wrote to him telling him about my interest in the Zwar families and the Wends. In his reply, Arthur enclosed a copy of the Zwar Family Tree, going back before the Zwar’s arrival in Australia in the 1850s. In 1922 his father had written to the Lutheran Pastor at Gröditz, Saxony, who sent him the Zwar Tree. The lists included the Zwar relatives who had remained in Saxony and didn’t emigrate to Australia. So, I went to the Post Office in Gladstone and found the name and address of three Zwars in the Melbourne phone book. I wrote to all three, and all three replied and said they were originally from South Australia and were not Michael Zwar descendants! In time I did make contact with some of Michael Zwar descendants in Victoria and I even visited one family out west in Queensland that had moved there from Victoria. In Brisbane I called several times on the aged Garry Zwar, of “Zwar washing machine” fame. I didn’t realise it fully at the time, but Garry was actually a closer relative to me through my Becker mother, than my Zwar father. Garry’s mother was my mother’s auntie, Bertha Becker. Garry had travelled through the eastern states of Australia selling his patented washing machines. He had spent time with the Zwar relatives in Victoria. Garry passed on to me lecture papers by Dr Bernard Zwar in Melbourne. I lived about 400 kilometres north and rarely made it to Brisbane, so I only made several visits to Garry. However Garry wrote me a number of detailed letters that include some Family History on my Becker and Zwar ancestors. The 1970’s turned out to be a fruitful time for me to learn about the Wends, as well as more coincidences in my search for information on the Wends and the Zwar and Becker families. I moved to Maryborough, Queensland, in late 1973 and my neighbouring Lutheran pastor in Bundaberg was Rupert Burger, the most knowledgeable Lutheran person in Australia on the Wends. In 1976 the Yearbook of the Lutheran Church of Australia included a 40 page history by Rupert titled “The Coming of the Wends”. This was the first significant history of the Wends published by an Australian. (It has been reprinted and is still available for purchase.) We spent many hours together and travelled to Synods and Pastor’s conferences together. Rupert always gave me the honour of reading his articles on the Wends before publishing them, but I rarely had any suggestions to make. In the early 1970’s I tried to find out if we still had any Zwahr relatives in Saxony. Arthur Zwar had a letter, written to his father in 1922, from one of the relatives in Germany. With help to write a letter in German I sent a letter to the Lutheran pastor in the area asking if there were still Zwar relatives at this address. Eventually a reply came back to say there were no Zwar relatives at this address. I don’t know if he actually enquired, or if the postal system and house numbers had changed during the War, but we eventually discovered that we did have relatives at the same address. The descendants still live at that address today and are very keen on the Zwar family history. In the 1970s I gained more knowledge about the Wends from several people in Texas than I gained from anywhere else in the world. In the mid 1800s, a huge number of Wends went to Texas, from what is now Germany, about the same time as our Wendish ancestors came to Australia. Today, when the Wends have their annual Wendish Weekend in Texas they get 1,000 to 2,000 people attending. In Australia we might get 50 to 100! I made contact with Robert through Geoff Saegenschnitter, a distant Becker and Zwar relative of mine in Australia who has always been vital in helping me with family and Wendish information. Robert Robinson-Zwahr was a remarkable historian. A gifted and energetic scholar, Robert lived in Texas and was fluent in German. He made lengthy visits to Germany to search out the Zwahr relatives. In the process he gathered information and photos on a number of Zwahr and Zwar families in Germany and other countries, even though he could not find a direct connection with many of them. He collected information and photos we sent him about our Zwar families in Australia. Over the years Robert sent me photocopies of many articles on the Wends that had been published in Texas in the previous 100 years. We sent him photos of our families and information on our ancestors in Australia. He hoped to publish a history of all the Zwahr and Zwar families he had contacted, including our Australian families. It was Robert who informed me that I still had Zwahr relatives in Saxony. All contact with our Zwahr relatives in Germany had been lost before the Second World War. In fact we didn’t know if any of them had survived the war. In Germany Robert came across Ernst Zwahr in Göda who could remember that his grandfather Karl Zwahr had told him “a brother named Peter had gone to “Wirra Barra” in Australia”. That was all Ernst could remember. Robert wrote and let me know of his discovery. Wirrabara is a town close to where I grew up in South Australia. My great grandfather, Peter Zwar, had lived his final years at Wirrabara, and he was that brother. The broken link with our relatives in Germany was mended by a Texan! This vital knowledge enabled my wife, Del, and myself to meet up with Ernst Zwahr and his family a few weeks later in 1984. Our meeting may have been the first with our relatives in Germany for about 80 years. Robert was single and suffered from a severe form of rheumatoid arthritis. Despite this, he published two massive volumes (One has over 1500 pages) on his ancestors, including his Zwahr family. Robert was associate editor of the Institute of German-American studies. Sadly Robert passed away in the late 1990’s. He was born in 1940, the same year as myself. In July 2006, in a rare coincidence, a friend told me he had seen a collection of Zwahr photos listed for sale on ebay. When I went to the site I was astonished to see a photo of my own family. I realised that the photos were Robert Robinson-Zwahrs, as they were photos I had sent him. I contacted the publishing house in the USA and told them about my link to the photos and they happily sent me the photos for the cost of the postage! (There are still some great people in the world!) The collection consists of over 200 photos of overseas Zwahr families, including some from Australia, but mostly of Zwahr families living in Germany. I think they could all be a collection of Zwahr families not in Robert’s Zwahr line. I plan to publish some of the photos on this website to see if we can find out where they live in Germany. Most of them have names on the back, but not the names of places in Germany. Please note: I do not have Robert’s collection of photos of his own ancestors and relatives, such as those he published in his own Family Histories, pages 295-390, 631-641, and 1496-1505 in one of his volumes. The only photos I have were a small box of photos of those not his relatives, like people in Australia, England and Germany. The book company bought a few of Robert’s books in a ‘sale lot’ and it included this small collection of overseas photos of his non relatives, including my own family here in Australia. In the mid 1970’s Dr Max Lohe, the head of the Lutheran Church in Australia, received a draft copy of George Nielsen’s book “In Search of a Home”. George had spent six months in Australia researching material for his book on the Wends who migrated to Australia and to Texas from what is now Germany. Dr Max Lohe was a keen historian, but not with a lot of interest in the Wends. So after checking it out he passed the draft copy on to me as he knew of my avid interest in the Wends. It was great to read the best history on the migration of the Wends from Germany to the New Countries. The most exciting discovery for me was in the footnotes, where George Nielsen referred to some Zwar letters. Our Australian Zwar ancestors had written letters home to Saxony and they were printed in the Wendish newspapers. Eventually I was able to get copies of these letters, but that is another story. Dr George Nielsen’s book “In Search of a Home” was first published in 1977 and is still the best publication on the migration of the Wends in the English language. When I agreed to be president of the Wendish Heritage Society in Melbourne again (but only for a year) after my retirement, I emailed Dr George Nielsen and asked if we might be able to have copies of the private notes he took on the Wendish families in Australia. To our amazement, Dr Nielson sent us his original notes along with information he had collected on over 240 Wendish families who came to Australia from Lusatia, the Wendish area in Germany. I have scanned the notes and put them on CD’s for safe-keeping. Joel Blackburn, the Vice President of our Wendish Society, is a wizard with search engines. Joel entered every name and place mentioned in Nielsen’s notes on a search engine. (A massive undertaking!) I have started a “Wendsonline” project whereby people can email me for information about their Wendish ancestors. Joel’s search engine enables me to find the relevant information in Dr Nielsen’s Notes, and those enquiring can often find out where their ancestors came from in Lusatia and who they married. Wendsonline attracts enquiries from around the world – on average about two a week. I spend a day each week sending replies. In Australia enquiries often come from Perth where families moved some years ago and lost contact with their relatives. Wendsonline is my main service to the Wends in my retirement, and I get a lot of joy helping people find their Wendish roots. I read recently that Dr George Nielsen has asked the Wendish Society in Texas to put all of his Notes on Wendish families, including USA, online. This will be a valuable Wendish resource for people throughout the World. In the 1970’s when I learnt from Dr George Nielsen’s footnotes that there were Zwar letters in Saxony, Robert Robinson-Zwahr put me in contact with Pastor Siegfried Albert in Saxony. Siegfried Albert was now the Lutheran Pastor of the Gröditz Church of our Zwar ancestors. Pastor Albert helped me enormously in very trying circumstances. He worked under communist rule to minister to the Lutheran people living in the villages surrounding Gröditz. He was one of only a few Lutheran pastors who could minister in both the Wendish and German languages. Over a period of years Pastor Albert went to the archives and photocopied Wendish letters from Australia in the 1850’s, including some Zwar letters. He translated them into German, typed them up and posted both copies to me. I would then find someone fluent in German to translate them into English as my German is limited to the school German I struggled to pass (up to Leaving Honours) in Adelaide. With a lack of use my German had quickly deteriorated. I wanted to send Pastor Albert some money for his trouble but it was illegal to take or send money to anyone in East Germany. Pastor Albert had a sister who lived in West Germany and she was allowed to visit her brother. She would ask Siegfried what she could buy for him in the West with the money I had sent her. She would buy it and take it to Siegfried on a visit. This went on for quite some years. Ray Deutscher told me he wrapped paper money in silver foil and sent it in cards and letters to his relatives in East Germany. Years later I learnt the Wendish letters Pastor Siegfried Albert copied and sent to me were the only copies in the Western world at that time. Dr George Nielsen had visited the archives In Saxony and someone fluent in Wendish and German had told him what the letters were about, but he didn’t have actual copies. I became aware that my great grandfather, Peter Zwar, had at one stage lived at St Kitts on the edge of the Barossa Valley in South Australia. Peter left St Kitts in 1880 and moved north to the Appila area where I grew up. I hoped one day I might be able to find the site of the St Kitts property where Peter had lived 100 years earlier. Imagine my delight and amazement when I received a letter from Reg Munchenberg, (whom I had never heard of), telling me that he owned the farm at St Kitts, and that the house and barn Peter had built were still standing. The letter included photos of the property and the original buildings! Reg is a leading historian in the Barossa Valley. I have been able to visit the property and record many interesting aspects on video and in photos. An unusual sequel occurred several months ago (2012). Through Wendsonline, I received a request from the USA for information about George Boback. George was a Wend who had emigrated to Australia in the 1850’s, returned to Germany in the 1860’s, and then moved to the USA. The USA enquirer was a descendant of a Boback son born in Australia. What hope did I have to find information on a Wend who spent about 10 years in Australia in the early years before going back to Germany and then on to USA? By a remarkable coincidence my great grandfather Peter Zwar had bought the St Kitts property from George Bobak when George sold out to return to Germany! Through Reg Munchenberg, and Geoff Saegenschnitter – also a descendant of Peter Zwar and a leading histoian of the Barossa Valley – they could give a lot of information about George Boback, his first wife and child who died at St Kitts, and give many details about the second wife and their two sons born at St Kitts. There is a sad sequel. The Boback son born at St Kitts had two sons in the USA and both drowned as children in a river tragedy. They were the last of this male line of the Boback family. Living in Queensland meant we could only visit our families in South Australia about every three or so years. My wife’s family lived on a farm at World’s End near Burra, and my family lived further north near Laura. This left little time to spend in Adelaide or to visit distant relatives. When in Adelaide I would visit Arthur Zwar. I had hoped to convince Arthur to publish a book on the early Zwar families but he said he was too old. Arthur was a walking encyclopaedia of early Zwar families in Australia! He knew the names and dates of every original Zwar, including all of their children. He kept it all in his head. When he wrote to relatives he would fill them in on their ancestors, so over the years I have collected copies of many of his letters. I hope to publish them on this website. I would also visit Cyril Hauschild. Cyril was not a Zwar, but he had married Lucy Zwar, a descendant of Peter Zwar. Cyril had been involved in publishing a book on his own Family History. When his wife died he decided to use his time as a tribute to her by collecting the information for a Zwar Family Tree. He started visiting her relatives all over South Australia, and any Zwar, including the Johann Zwar families, and he wrote up their names and dates for the Tree. After Cyril died in 1984 his family passed on to me the material for the Tree he had been working on. I still have it, all hand written. This also meant that for a time it was left to me to continue his work. I even bought a typewriter with very small print so I could fit a lot of names onto every page. Then my cousin Gwenda Obst nee Zwar came to the rescue. More about Gwenda later. I tried to visit other Zwar relatives in South Australia if I had time. It would be too much to list them all here. Both Johann and Peter Zwar had lived into their nineties, so some of their grandchildren could remember them. I usually took notes and these are precious now. The first of those I visited who knew both Peter and Johann was Hulda Mickan at Ebenezer, a granddaughter of Johann Zwar. She told me about my great grandfather, Peter Zwar the carpenter, and where I could find local feeding troughs he had made for horses and cows. When I asked about her grandfather Johann she surprised me by telling me how she had hated him. For example, she described how he had removed her decayed tooth without anaesthetic, and when she cried he grabbed her by the hair and shook her head. Apparently the relationship didn’t improve after that. Hulda remembered she had a mounted photo of her grandfather, found it and insisted I have it. I tried to refuse but she announced she didn’t want his photo in her house! I still have the photo. When I attended the General Synod of the Lutheran Church in the Barossa Valley in the mid 1970s I took the opportunity to visit the original Johann Zwar home at Ebenezer. I introduced myself to Mrs Roehr and she made me most welcome. She told me I could look in the old loft and even supplied me with an old pair of overalls as it would be very dusty up in the loft. She was right about the dust. It was inches deep. and there were odds and ends people had thrown up there over the years, but I was only interested in any old literature. As I sat in a spot contemplating the scene I scratched the dirt with my foot and felt something there. On digging it out I was amazed to find a hard-covered old Wendish catechism. On digging further I found old Lutheran German ‘newspapers’, still in their wrappers, from the late 1800’s. There were some old school books. Mrs Roehr gave me lunch and found some cartons so I could collect this material. In the dust I found a number of old letters written in German script, still in their envelopes [but someone had cut the postage stamps off]. In the early days an envelope was stamped by every post office it passed through. The postmarks were clear to see and I was surprised to read they were mainly from Laura and other towns where I had grown up in the mid north of South Australia. It turned out that Bertha Becker, the sister of my grandfather Becker (on my mother’s side) at Laura had married Paul Zwar in 1898 and the married couple had lived here on this property at Ebenezer in the Barossa Valley. The letters in the loft were from my mother’s uncles and aunties – Bertha’s brothers and sisters, including my Becker grandfather. There are maybe 50 or so of these Bertha letters. A Becker married a Zwar. That is one of the reasons this website is called Becker-Zwar! I had flown to the Synod from Queensland and had little room for luggage. So I put most of the material in cartons and gave them to Dr Max Lohe who was an avid collector of material for the Lutheran Church archives. I put some books in the Luther Seminary library. I kept the letters and some school books and a few part pages of Johann Zwar’s records of his patients. The latter I have passed on to Paul Zwar’s descendants, but I still have the letters. The letters have been translated for me by two different people. One is Pastor Rufus Pech who grew up near Laura and knew many of my Becker relatives and other folk mentioned in the letters. My mother Rita was the eldest in the Becker family, so I went through the letters with her so she could tell me who the people were who were mentioned, often only by their first name or even a nickname. I still have two living Becker uncles. My Uncle Melvin aged 95 is a godfather to me, and by coincidence the Paul Zwar at Ebenezer was his godfather. In December, 1976, we moved from tropical Queensland to Warrnambool where the cold winds blow up from the South Pole. We lit the open-fire every night to try and keep warm (in Summer!). We now lived on the edge of the Western Districts of Victoria, a main centre of early Wendish settlement around Hamilton, and to the north in Horsham in the Wimmera District. Only a few of these people knew about the Wends. Many thought Wendish was just a German dialect and didn’t realise it was a different language altogether. Now I lived in Victoria which was the home of the first Zwar to migrate to Australia. I can recall driving to Broadford with my daughter, Robyn, for the first time and meeting Dolph Zwar and his family who lived on a section of the original Zwar farm. We were made to feel most welcome. In the years ahead we were treated wonderfully well by all the Zwar families in Victoria. For example, when we attended the funeral of one of the Zwar patriarchs, Del and I slipped into a back seat of the church, and the family insisted we come up the front and sit with them, “because you are family!” Several months ago the Bidstrups held their Diamond Wedding celebration in Melbourne and we were invited to attend. I couldn’t help thinking that I was a Zwar from South Australia and now a welcome part of Michael’s family. In the 1980’s my original aim to finish the histories of the Michael Zwar branch was finally achieved. I completed a detailed history of Michael and his wife Agnes and each of their eleven children, with valuable assistance from many of their families. They shared confidential items and on a first visit might say, “No one else will tell you this but …” and then the next one would say the same! They all knew and shared it with me. In 1982 I took on the challenge of a double task in the Eastern suburbs of Melbourne. I accepted the challenge to become a chaplain at Luther College part time, and to work for the Ringwood Parish to begin a new Lutheran congregation based at Luther College in Croydon. The latter was achieved in three years and I then became a full time chaplain at Luther College (for another eight years). A German teacher asked me if I would give a talk on the emigration of Germans to Australia to the German teachers in Victoria at a coming conference. I accepted as I thought I could entertain a handful of German teachers. The talk was at Monash University in a large lecture theatre nearly full of ‘German teachers’. I noted that some of them were rather elderly, and some males had flowing hair and long beards. Afterwards I was told these were professors from the German departments including German history. However it went well as some of them pleaded with me to publish my work. I based the talk on the Zwar letters describing their emigration to Australia. In the late seventies I also met and collected the history of descendants of Johann and Peter Zwar who had moved to Victoria. Dr John Zwar invited me to stay with him and he helped me gather information on his famous father, Dr Bernard Zwar. I visited the Royal Melbourne Hospital to see the portrait of Dr Bernard Zwar, an oil painting that hung in the entrance of the hospital to honour him as the key person who had the Royal Melbourne hospital built there. Would you believe, the Melbourne university students had stolen the painting that week as a prank. It was returned, and I saw it on a later visit. [After later hospital renovations the portrait has been moved to pride of place in the historical room at the hospital.] Dr Bernard Zwar became such a famous figure in Victoria that I collected a lot of information on him from many sources. The Petschel family also treated me wonderfully well. When there was a Lutheran Church Synod in the Wimmera district of Victoria I would stay with Con and Vera or Lou and Clara Petschel and they would tell me stories of their grandparents, give me photocopies of material and photos and I would make notes of everything they shared with me. Their grandmother was Maria Petschel, the daughter of Johann Zwar who came out to Australia as a three year old from Saxony in 1851. I had the pleasure of meeting up with other Zwar descendants from South Australia and now living in Victoria, including some from Peter Zwar, my own great grandfather. Del and I planned to use my first long service leave to visit Europe. I had hoped to get permission to enter East Germany, to go behind the Iron Curtain, and visit the Wendish area my Zwar ancestors came from. At this stage we didn’t know if there were any relatives left in Germany. We found it almost impossible to get a visa to go to an area off the beaten track into East Germany. We even visited the East German consulate in Canberra and went through the spooky experience of several sliding doors opening and then closing behind us. But no door would open to let us into the Wendish area into East Germany. After trying fruitlessly, the Russian travel agency said they would send another cable if I paid them $20, but they could not assure us a good result. It sounded like a lot of money in those days for no likely result, but I paid up. Otherwise I could have spent the rest of my life wondering if I had spent the money whether there might have been a positive result. Some months later we received a message that we would be allowed two nights in Dresden and two nights in Bautzen. Bautzen is the ‘capital’ or main city of the Upper Wendish area where the Zwars came from. Only a month before we left for Europe we received news from Robert Robinson-Zwahr in Texas that I still had Zwahr relatives living near Bautzen and gave us their address. We wrote immediately to Ernst Zwahr and he arranged to meet us at our hotel in Dresden. He lived about 60 kilometres away in Göda, near Bautzen. Two days later we caught the bus to Göda and Ernst met us along with his 28 year old nephew Andreas Zwahr. Ernst took us to his home to meet his wife Hildegard, his sister Martha, and a daughter Anita. Andreas greeted Del with a bunch of roses from Martha’s garden. We were served with a roast pork lunch and a dessert of stewed apples and strawberries. 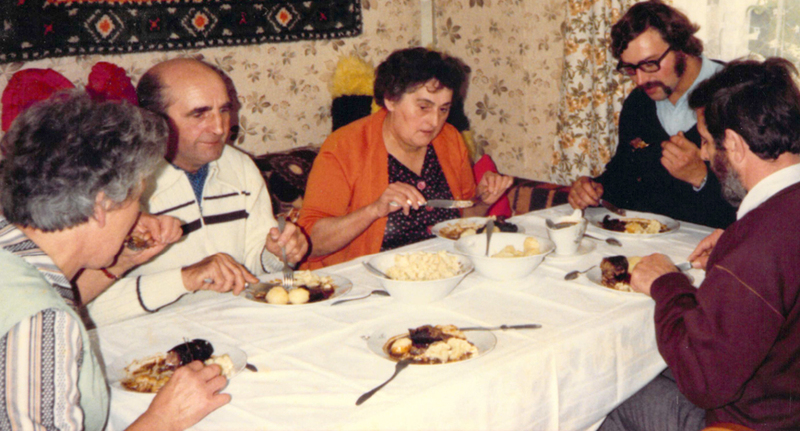 My first meeting with Zwar relatives in Saxony, from left; Hildegard and Ernst, Martha, Andreas, and myself, 1984. Del took a photo I now cherish of me at the lunch table along with three different Zwahr families represented – Ernst, his sister Martha, and Andreas, the son of another sister. Andreas is the last of the male line of our relatives in Germany with the surname Zwahr. [To this date, 2012, Andreas has no children]. Ernst came with us to Bautzen to attend a meeting he had arranged for us with members of the Wendish Institute. Dr Ernst Schmidt presented Del with a book he had written on Wendish Easter eggs. I passed on material from Robert Wuchatsch in Melbourne, and a copy of the 1976 Lutheran Yearbook which featured the article on Australian Wends by my friend Rupert Burger. This book had not been allowed into East Germany. I figured if I had it deep in my luggage the border security would miss it – and they did! It was the least I could do for Rupert and the Wendish cause. At our meeting Dr Schmidt told me that someone had discovered old family letters sent from Australia by Peter Zwar – my great grandfather. It took me about another 17 years before I could get copies of these letters sent to me in Australia. Such is sometimes the speed of family research. We were able to visit Pastor Albert who had translated and sent me the Johann Zwar letters. In the evening Del and I attended a Wendish comedy play in the Deutsche Sorbishe (Wendish) Volks Theatre. We had headphones to give us the words in German! It was a great experience to hear the Wendish language, my forefather’s native language, on stage. The following morning Ernst and his son-in-law Uwe drove us to the village of Drehsa, where our Zwar ancestors had grown up. It was just as well I knew this. Ernst’s grandfather had lived elsewhere and had died young. My Zwahr relatives didn’t know their ancestors used to live in Drehsa. When we arrived at Drehsa we asked round for the site of the Zwar home. We had a photo of the house taken in 1905 by Dr Bernard Zwar. The local people were quite keen to help us find the house. The town clerk joined in too and eventually we found an old woman sorting through a heap of potatoes. She recognised the house in the photo. It had stood over her back fence and next to the Hempel (who emigrated to Australia) house that still stands. The Zwahr home had been demolished about 1910. We visited the Gröditz Church and Pastor Mahling showed us the large volumes of Church records that go back to 1666. I was able to remember several dates for Peter Zwar and take photos of the entries in the church records. We met Mrs Mahling who would publish her book in Wendish on the Wends who migrated overseas to places including Australia and Texas. Her work was later published in German, and now is available in English. We also visited the neighbouring parish church at Hochkirch. We went to number 28 in Steindörfel where Ernst had grown up, and where Andreas now lived with his Aunt Martha. We attended the Lutheran Church service in St Michael’s in Bautzen, and then a Wendish musical concert. Pastor Albert took us for an interesting walk through the oldest section of Bautzen. We also went through the large Wendish museum. We had tried to buy a Wendish costume doll of a woman in the Lutheran Bautzen costume to display in our glass cabinet at home, but without success. We went to Grosspostwitz where Ernst’s grandfather had lived and he had run a butcher shop. We asked people in the street about any Zwahr folk living nearby. We ended up at the home of a Zwahr who was a butcher. He could tell us that he was not from our branch of the Zwahr family but he was from the same line as Robert Robinson-Zwahr, who had visited him from Texas. It was an exciting time. It was also a very sad farewell at the railway station when we had to leave. It is the same railway station my great-grandparents left from on their journey to Australia in 1854. In 1988 I received a letter from my cousin Gwenda Obst nee Zwar offering to take over the building of the Zwar Family Tree. I could not have had a more welcome offer. I had been concentrating on collecting the history of the Zwars who emigrated, those who stayed behind in Germany, and the first generation born in Australia. This history would soon be lost with the passing of the older relatives. The Family Tree can always be put together long after we are gone. I had been struggling to add to Cyril Hauschild’s work on the Family Tree for some years. There was still a long way to go, and Gwenda took it on and has done a marvellous job. She has written countless letters, contacted many families over the years, and put it all together on the computer. The Trees you find on this website is the result of all of her dedicated work. The youngest generation of the Tree is still to be added. You are welcome to send the details to me. Please send in any information that might be missing or need correcting on the earlier generations. In the late 1980’s Alfons Frencl stayed with us on his visit to Australia. His visit would lead to doors opening on my research that I would not even have dreamt about. Alfons is a leader of the Wendish movement in Germany. He has published books on the overseas Wends and been an editor of Serbska Protyka, the annual Yearbook which includes numerous articles on the Wends and their lifestyle, customs and traditions. Alfons was a high school teacher of English, and is also fluent in Wendish, German and Polish. Alfons asked me to write an article about the Zwar families in Australia. Every Zwar will know how we always come last in the queue and on electoral roles and in telephone books so I called the article “Z to A” ‘The Zwars to Australia’ so for a change we might come first. Alfons translated it into Wendish and it appeared in the 1992 edition of Serbska Protyka. The English version is on this website. Following the publication I received a letter from Mrs Lenka Sauer in West Germany. Lenka had read the “Z to A” article and got my address from the editors. Lenka was 90 years old and had been born in Drehsa and she had letters and photos that had gone to Germany from the Zwar and Kaiser families in the 1800’s. I could scarcely believe my eyes. In my reply I sent her a little old photo I had of a seated young couple with a baby in their arms, and an elderly couple standing behind them. It looked as though the photo may have been taken in Saxony. I had a vague hope that Lenka might be able to recognise the people in the photo. It was a slim hope. Lenka replied that she was the baby in the photo along with her parents and grandparents. The photo was taken on the day of her baptism! Lenka sent me copies of many letters sent from Australia in the 1800’s and even later to their father George in Drehsa from the children of his first marriage who had all emigrated to Victoria in Australia. These letters and some photos were passed down in Saxony to the grandchildren who included Bernhard Mihan and Lenka Sauer. And they transcribed the letters from the old German script and typed them up and sent them to me. I was so excited I posted off copies to the Kaiser descendants I knew of in Australia who might be interested in the letters. Some didn’t even acknowledge the material, a reminder to me that not everyone is interested in the history of their ancestors. Others were keen and thankful. In the comprehensive and excellent Family History “The Fingers of Australia and Silesia 1703 – 2003” Glenda Dovile has included translations into English of over 20 letters Andreas Kaiser sent home to Drehsa from Melbourne between 1853 to 1905. In Australia Johann Zwar had gone from the Barossa Valley to Melbourne and met up again with Anna Kaiser who had been a guest at his first marriage in Drehsa. They married, and there are many letters by Anna and Johann to her father in Saxony. These letters have been translated into English by Pastor Clem Schmidt. He is one of the translators I plan to give special credit to in a special acknowledgement on this website. I think the translators are a breed apart who make precious and valuable contributions to Family Histories, including this website. 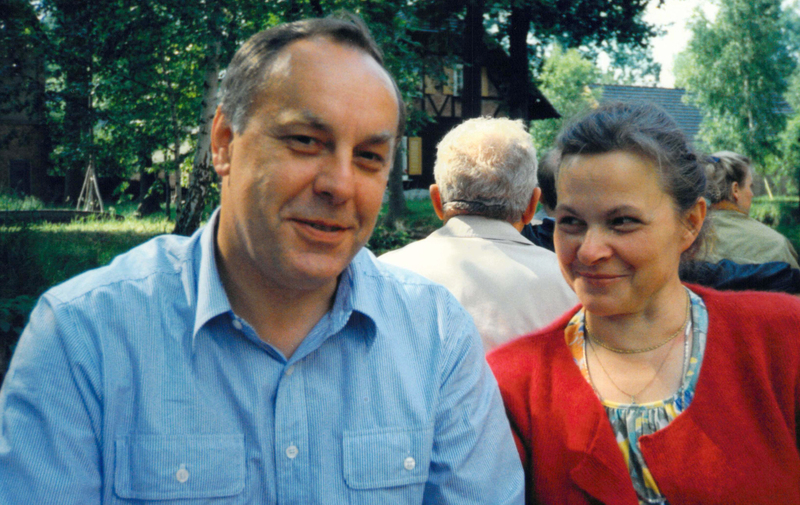 Del and I were able to visit the Zwahrs in Saxony again in 1994, ten years after our first visit. The infamous Wall between East and West had gone down. We were able to stay as long as we liked. We stayed for ten days courtesy of Hildegard Zwar. Ernst had passed on. We met other Zwahr relatives, including the gracious Carmen Gürtler and her family who still lived where her grandparents were living in 1922. We visited all the old sections of the old city of Bautzen. Our ancestors lived in the village of Drehsa, only about 10 kilometres from Bautzen. In Drehsa we visited Walter Dittrich. There have been many co-incidences, or times I was lucky over the years. Meeting Walter Dittrich in Drehsa was one of them. Walter had not grown up in Drehsa but he had moved there many years earlier. He asked the locals questions about the buildings they took for granted, and the people about their ancestors. Over time Walter became the historian, not only for Drehsa, but for the surrounding villages, and for Bautzen. He generously gave me copies of his work. Walter took me for a walk through acres of what we Australians might call lush bushlands, or natural parklands nearby where the birds were singing in the trees that had been planted by Napoleon’s troops. Apparently Napoleon was a ‘greenie’ who had his soldiers plant countless trees near where his troops camped. It is such an enchanting area that when the last nobles of the area died a massive gravestone or mausoleum was built within its acres of nature and beauty. Some years later Daryl Day, a Zwar descendant living in Darwin, also called on Walter Dittrich and Walter gave him more material, which Daryl had bound and sent me copies. These include the history of the village of Drehsa and its people, including, for example, records of all the deaths in Drehsa from 1771 – 2002, lists of the Drehsa children who attended the original school at Wurschen 1829 – 1850 [when some of our Zwar ancestors were students there], and records of the city of Bautzen going back about 700 years. Walter has passed on but I am sure his work will be treasured in Australia for generations. Alfons is an author and a leader of the Wendish movement in Germany who had stayed with us on a visit to Australia. He is a wonderful host as he is fluent in German, Wendish, Polish and an English teacher in the local high school. Del and I were privileged to spend a few unforgettable days with Alfons and Ursula Frencl. It was also fascinating to hear them converse in Wendish with each other. Alfons had asked us for a list of places Del and my German ancestors had come to Australia from Germany that are now part of Poland. The next morning we crossed the Niesse River into Poland. The poverty was obvious. Often not a car in sight. Only a single horse pulling a large wagon. Old women sweeping the footpaths with little ‘witches’ brooms. We called at the church in Prittag where my Becker ancestors had worshipped. Alfons could speak Polish so he found someone who had a key to let us into the church. I then videoed Del, a musician, playing the pipe organ. We visited the nearby Becker city of Grünberg and I remarked to Alfons that I was amazed at the size of the city and its massive cathedral. Alfons replied that he was just as amazed when he was in Australia and they pointed out Grünberg in the Barossa Valley named after this city, and all he saw was a little country church with some trees and a herd of cows! We spent time in the Klemzig Church, where pastor Kavel and the first large group of Lutherans migrated from, to Australia in 1838. Alfons remarked that I was probably the first person from the Western World to video the inside and outside of this church. Just as interesting for me was our visit to Tschicherzic, the solitary backwater of a river nearby that was the launching place for the barges Kavel’s people travelled on to go to Hamburg where they boarded their ships to Australia. “They went all the way from home to Australia by water!” remarked Alfons. We also visited the churches of the Wandkes, and for Del the churches and villages of the Wittwers and Grossmanns and Henzels. All in one day. There is nothing quite like the feeling one experiences when walking in the footsteps of one’s ancestors. We went to Luppa for a Wendish Church Service. It was a wonderful experience to be part of a church service in the language of my ancestors,even though I couldn’t understand a word, but we could sing the hymns. It was even more wonderful that the service was taken by Pastor Siegfried Albert, the very same pastor who had sent the copies of the original Zwar letters to me in Australia, translated in German, many years earlier. For lunch Ursula had prepared us a typical Wendish wedding breakfast. In the afternoon Alfons took us to Radibor where we experienced a Wendish Festival. One of these is held every few years. It began in the village square with a band and a procession going past us made up of Wendish groups dressed in vintage Wendish costumes along with vintage wagons and implements and other articles. Then we followed to the oval where there was an outdoor stage. The afternoon was taken up with Wendish stage performances by choirs, dance groups, performed by children and adults. One was a professional group that tours overseas countries. As I was president of the Wendish Society in Australia I was introduced to the President of the Wendish Domowina [Institute], and was interviewed for a Wendish newspaper. It was a fascinating afternoon and I was able to video most of it. For me the three days with Alfons and Ursula had been like a dream. The next day Uwe, a relative, drove us to a home by a little lake, that had been the original Wurschen school some of our ancestors attended. We called on Trudla Malinkowa at the Zwar church at Gröditz. Trudla showed us the draught of her book she was working on in Wendish about the Wends and emigration to Australia and USA, with the hope it might be translated some time into German and maybe even some distant day into English. All three have now happened, and one can now buy the book “Shores of Hope – Wends Go Overseas” by Trudla Malinkowa. Trudla also gave me interesting information on Johann Zwar, and then her husband, the pastor, showed me the volumes of old church records and I was able to photograph a few entries of my Zwar ancestors. We visited Horka and were able to photograph the church records of Del’s Heinrich Family ancestors, that include some Wendish Tschoppe ancestors. Entering the Church was like stepping back hundreds of years in time. We visited the Kaiser house in Drehsa and the Hempel [who went to Australia] house, next to where the Zwar house had stood, I went up a hill and took photos of Drehsa from the same spot photos taken about 1905. Not much has changed! The buildings in the old streets were nearly all there when our ancestors lived there, and it is almost spooky to walk them. We had a visit from West Germany from Bernhard and Hildegaard Mihan and son Michael, with apologies from Lenka Sauer who was too old to make the journey. Bernhard was deeply moved to meet me and he gave us special presents, including one from Lenka, the one who had read my ‘Z to A’ article in the Wendish magazine and so made contact with me and sent me the Kaiser letters. Late in the 90’s I attended another Church Synod in the Barossa Valley. I spent one evening with a few Johann Zwar relatives and we discussed publishing the Zwar Family History. We decided it would be best to build a Zwar website. I was living in Sydney at the time and in the following year or two my daughter Robyn designed and paid to have the www.zwar-zwahr.com website built. Entering Zwar information kept me busy and I think it was very successful. In those days one had to pay specialists to enter information onto a website, and this made it expensive. However it was much appreciated and I had a number of contacts from Zwar folk in overseas countries. Unfortunately some of the articles ‘dropped off’ and disappeared and it was too expensive to re-enter them. I don’t know how long they had been missing. I was informed by Johann Zwar descendants in South Australia that they had decided to publish a book on Johann Zwar. It thrilled me that at last someone else apart from me was writing up the history of some of our Zwar ancestors. I had written up about 20 biographies by this time put them on the Zwar website so I gave permission for the work I had researched over the years on Johann Zwar and some of his relevant descendants to be used. I flew to Adelaide to attend the Reunion at Ebenezer in the Barossa Valley, addressed the congregation briefly after the morning church service. My sister and I then drove round to visit some historic spots in the local area before the afternoon Family Reunion. We became hopelessly bogged in a side road that was not a through road. No one came along that road. We tried without success to make contact on the mobile phone. After a few hours we managed to find a farmer who came and towed us out of the bog in his tractor. He was a Becker, and possibly a distant relative. The locals enjoyed the story about the bloke who could drive in Sydney traffic but got lost in Ebenezer [a farming community and not even a town]. Maybe it was an omen of what was to come. We arrived at the afternoon Zwar re-union celebrations just as everyone else was leaving. However I attended the evening Dinner and met the publisher of the Johann Zwar book who I now learnt was married to a Zwar descendant. The next morning on the plane flight back to Sydney I had time to open the Johann Zwar book I had been presented with for making my research material available. After reading a few pages I went into a state of shock. The publisher had used Gwenda Obst’s years of work compiling the hundreds of names of the Johann Zwar Tree and putting it onto computer. Both Gwenda and I are Peter Zwar descendants – and not Johann Zwar – but we had both made our work available. Gwenda didn’t rate a mention in the book. The publisher had put his own copyright on all of her work. So I turned to see what the book had said about my contributions. It was even worse. The publisher had not only put his copyright on all of my work, but went on to state that someone else had written all of my work and had passed it on to me! I was completely dumbfounded. It was the lowest point of my life in Family History research. Over the years I had experienced many wonderful co-incidences and made amazing discoveries researching the Zwar Family history, so I suppose one should expect to also experience the opposite. However I am only human and I am still dumbfounded. After I sent letters of protest to the publisher Gwenda’s name was included in a later edition, and I received a brief mention, and the absurd statement that my work was all written by someone else was removed. However the publisher kept his copyright on all of Gwenda and my work. I mention this because it raises a problem for me in building this new Becker – Zwar website. Can I publish all of Gwenda’s valuable work with her copyright on this website, and Gwenda is happy for me to do this, when someone else has published a major section of it and put their own copyright on it? Can I publish on this website the Zwar histories I have written and then put copyright on my own work, when someone else has published it and put their copyright on it? Following my visits to Germany other Australian Zwars have also visited our relatives in Germany. We visit descendants of two brothers in Germany who did not emigrate to Australia. I am as closely related to these Zwahr descendants in Germany as I am to Johann and Michael Zwar’s descendants in Australia. Over the years I have tried to stay in touch with the relatives in Germany but it is a struggle as they do not use English and I can barely write in German. You will find information and their Trees on this website. Daryl Day has been a great help to me in researching these relatives in recent years. He has visited the distant relatives in Germany and helped gather details of their branches of the Tree. Daryl is unusual in that he is a descendant of both of the Peter and Johann Zwar brothers. Daryl has also searched in church records in Germany and found there might be some Zwar families way back in our Tree and this line died out by about 1800. Daryl also collected more valuable material from Walter Dittrich, the Drehsa historian, before Walter passed away. When he visted Drehsa, Daryl visited the Kaiser home just when it was being completely renovated. He was able to photograph a well in the Kaiser house that had been the village’s only source of water for the village in droughts. Unfortunately, as can happen with modern digital gadgets, he lost all the photos for this trip. I think the prize for the best decision on choosing a wife must surely go to Richard Zwar. Richard married Yvonne, who is an Australian who is also fluent in German and Polish as one of her parents is Polish and the other German. When eating in a cafe in Bautzen, for example, Yvonne can understand what the Wends are talking about at the next table as Wendish is closely related to the Polish language, and she can fluently speak German with the relatives in Germany, as many of them no longer speak Wendish. I don’t want anyone to think that my time is totally taken up with Family History. It would usually be less than one day per week. I spend much more time in my workshop doing woodcraft. I enjoy this hobby in my retirement and I consider this to be more important than Family History as all of the proceeds from several galleries I supply go to assist the poorest people in the world through Lutheran World Service. The owner of one of the galleries also puts all of the gallery’s proceeds from my work to the same cause. When visiting relatives I have never cared about their religion. I visit them and respect them because they are family, and not because I am a Lutheran minister. Most important for me is to spend the time I have left with my wife and family. Del has been a life time partner even though she isn’t greatly wrapped in Family History. We share some important roles like me helping Del barrack for the Hawthorn footy team. In conclusionI I want to say a deep word of gratitude to my daughter Robyn who is helping me set up and build this Becker – Zwar website. It will include not only the Zwar families, but also the Becker families. This huge project has started. Without Robyn it would never have made a beginning. Thank you Robyn, not only from me but from all of the current relatives, and those of the future.